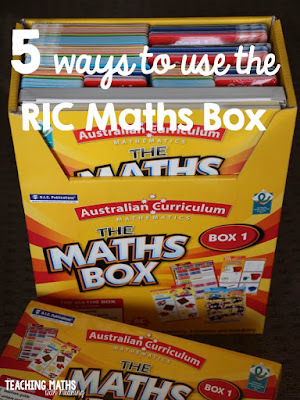 It's time for Part 3 of my review of the RIC Maths Box. As a recap, you can click on the link below to read more about the organisation of this resource and what is included in the Teachers Guide as well as a review of the activities. 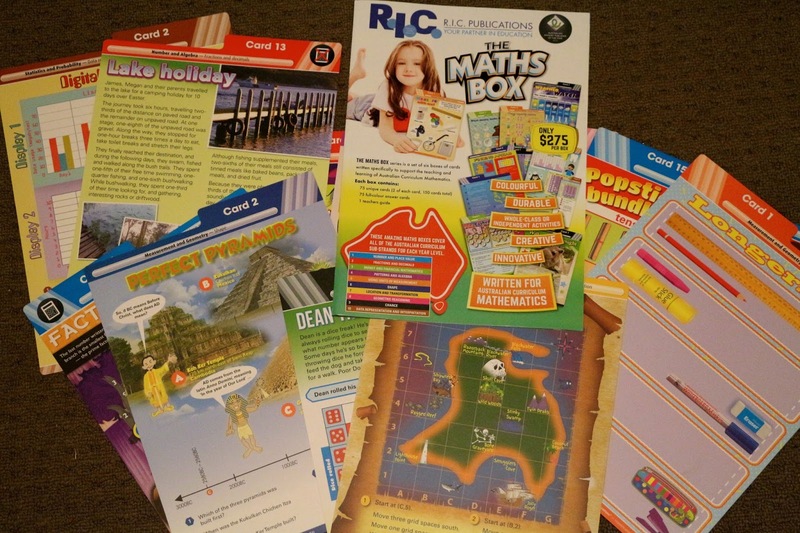 These activity cards would be just perfect small group Maths Centres. Although the Teacher Guide includes an answer sheet for students to fill out, I would teach my students how to write the answers in their Maths Book to save on photocopying. I could use the activity cards to highlight what I have been teaching in class, or expose the students to a new topic. Either way, activities are straight forward, easy to understand and engaging. With younger year levels I would use a mixture of activity cards and hands on activities. I don't ever want my students to become stale with an idea, so wouldn't use purely activity cards. With younger students, I would use the opportunity to invite parent helpers to read the questions out to the students. Students would not need to record answers in this case, the parents could use the questions as discussion points. If parent helpers were not available, it is a chance for buddy class members or teaching aides or peer mentors to be involved. I don't like to think anything is too hard! Older children will able to work independently on the activity cards. I can definitely imagine myself using the activity cards at report writing time. There are times when I give students an independent tasks and call students down one by one or in small groups to assess their understanding of a standard. Instead of having to make up an activity to use, RIC have made the activity for me and linked it to the Australian Curriculum - perfect! (I love anything that saves me time, especially at report writing time!). This is where having a Teacher Guide with the scope and sequence listed is of great benefit! The Teacher Guide also includes an assessment sheet, so that makes it even easier! There may be some students who you might consider marking up or down on their progression points. 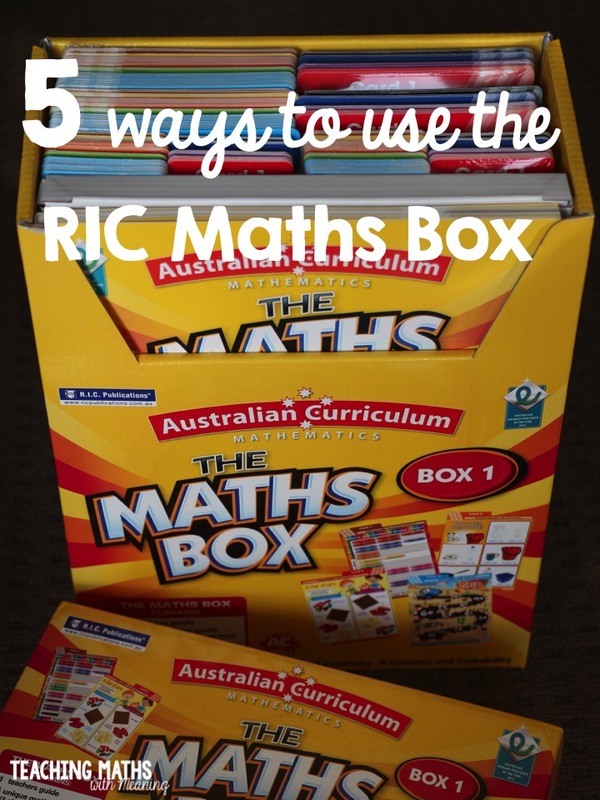 This would be instance where you could borrow the Maths Box from the grade level above or below and pull out activities for individual students to complete - again, the Maths Box makes life easy on teachers. Whole class activities can easily be completed using an IWB or document camera. By taking a photo of the activity card with an iPad or Elmo, you can project the card up onto the whiteboard and remove the card to turn over and read out the questions. As you go through the cards applicable to your current area of student, you will notice that manly lend themselves to be quick, 10 minute warm ups or discussion points. I would do this by having children sit on the floor in front of me, or using a digital projector. I would use the cards to help shape my teaching for the lesson as well provide students with great visual representation of the concept we are discussing. Due to the size of the cards, a digital projector is of great benefit. Activity cards could also be used for lesson inspiration. As I was flipping through the cards in the Maths Box 1, I looked at an activity and knew straight away an activity I could do with the students in the classroom to extend their understanding. I love it when activities just come to me. As all activity cards are linked to the Australian Curriculum, you know that each one with be purposeful and any inspiration that you have based on the cards with be good use of your time! In older year levels, these activity cards would be perfect for early finishers. Each week, I would pull out a selection of cards and students could work through the activity cards throughout the week. You could either use the answer sheet or teach students how to record their answers in their Maths Book. This would be a good opportunity to use the Math Box above you year level too to extend students. As you can see, there are many different applications to using the Maths Box in your classroom - I am sure you can come up with even more ideas! My absolute favourite thing about these boxes is how EASY it is for teachers to use, link to the curriculum and keep organised - perfect!I can't see how you could go wrong - purposeful and practical - my favourite! Stay tuned for The MATHS BOX! Part 4 coming this weekend, where I will tell you about how I would differentiate the activities in the Maths Box to meet individual student's needs.